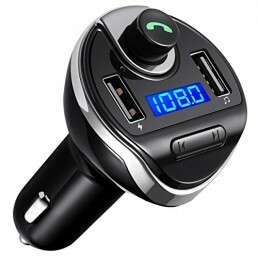 BROAD COMPATIBILITY – ToHayie car fm transmitter works with Bluetooth enabled devices, like iPhone, iPad, iPod, Tablet, Smartphones or MP3, MP4 Players via 3.5mm audio jack. CHARGING STATION – Comes with a 5V-1.1A charging port to charge most USB devices. Such as apple iPhone 7 6 6S Plus；Android Smartphones, Power Bank etc, better charging performance! 【BROAD COMPATIBILITY】 — ToHayie car fm transmitter works with Bluetooth enabled devices, like iPhone, iPad, iPod, Tablet, Smartphones or MP3, MP4 Players via 3.5mm audio jack. 【CHARGING STATION】 — Comes with a 5V-1.1A charging port to charge most USB devices. Such as apple iPhone 7 6 6S Plus；Android Smartphones, Power Bank etc, better charging performance! 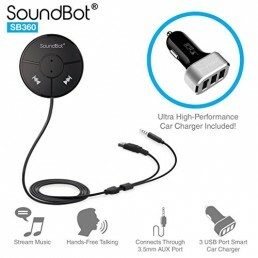 【HIGH PERFORMANCE】– Support A2DP, achieve the stereo music lossless transfer to your car speaker. Built-in microphone feature can set free your hands during answer the calls and help you safely drive.